Less traffic, cleaner air and more affordable transportation—these are just some of the benefits that the school bus provides. And since the school bus is the safest way to travel to and from school, it’s hard to find a reason to send children to school any other way. Obstructed views and distracted drivers put children at risk. 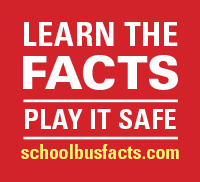 It’s important that parents and educators talk to children about ways to stay safe in and around the school bus, and that motorists follow laws pertaining to school buses in their state. There’s no question that communities depend on the school bus. But school bus service is often at risk when budget cuts are considered. Support is key to keeping school bus ridership strong in your community. Includes all resources available to the public except for the animations (see below). Approximate size of zipped package is 33MB.